Brian Clough, a master of bombast and king of quirky one-liners, always held the media spellbound, but the scale of his influence is better conveyed in his prominence now than it ever was when he was alive. Clough has been the subject of countless biographies, a novel and the film made from it. He won two European Cups with a provincial club and steered Derby County from the middle of the Second Division to the top of the First. He is, supposedly, the best manager the English national team never had. In recent times, though, the media has concerned itself more with Clough’s most notable failure – his infamous 44-day stint as manager of Leeds United. David Peace’s The Damned United famously novelizes that ill-fated spell, portraying Clough as an enigmatic and self-destructive obsessive, haunted by the successes of his predecessor. Peace’s short, abrupt sentences are intended to mirror Clough’s thinking. While entertaining to read, that approach to understanding Clough is flawed. It casts him as a caricature, an exaggerated parody of a manager who, while eccentric, was always as human as the next man. That Peace even bothered to write a novel about Clough is revealing in itself. When The Damned United was published in 2006, Clough seemed irrelevant as ever, a deceased legend of a bygone era. The power of nostalgia resuscitated his memory. The children of the ’70s and ’80s are all grown-up now, and they want to talk and write about the individuals who defined their childhoods. Clough, an icon of his day, is one drop in a wave of reminiscence. Where Peace’s book is fictionalized, Jonathan Wilson’s biography of Clough, Nobody Ever Says Thank You, which was released last year, is steeped in fact, sometimes to a fault: more comprehensive than earlier biographies like Provided You Don’t Kiss Me, it outlines in sometimes tedious detail each season Clough spent at the top of the game. Wilson depicts Clough as a manager ahead of his time — a walking, talking embodiment of personalities to come. Clough was a wheeler-dealer before Sky Sports News, a transfer hound before Harry Redknapp. He was as profane as Joe Kinnear, as entertaining as Jose Mourinho — a football man, but also a celebrity. He was simultaneously brash and savvy, and his career oscillated between the sublime and the ridiculous. His larger than life personality created a template for future managers. As Barney Ronay notes in The Manager, Clough was “the first manager mimicked by a million playground humorists. The first manager to have an identifiable hairstyle.” Clough was certainly no footballing innovator; his influence is most apparent in the personas adopted by modern football people, the men whose identities as coaches were shaped by Clough’s surreal example. Those men preserve his relevance. Clough laid the foundation for football’s advancement, but he couldn’t keep up with the game’s development. Changing rules, the increasing importance of money and the advent of the Premier League halted his ascendance. He refused to change his training methods when fitness became a vital part of the game, and he ignored even the most mainstream tactical innovations. 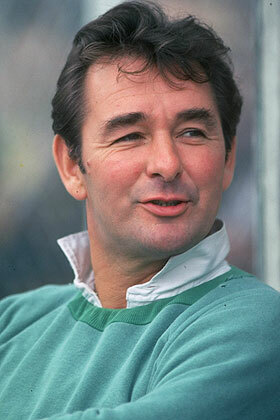 Clough was frustrated by player power and resented new regulations. His decline was already well under way when the Premier League kicked off in 1992, but his mental and physical collapse that season, coupled with Forest’s relegation, typified the devastating effect that football’s financial revolution had on so many heroes of yore. Clough was the victim of changes that his celebrity unwittingly unleashed. His personality meshed with the made-for-TV ideals of Sky-era football, but the principles on which he had built his footballing success did not. To many, Clough remains a symbol of a lost era — the “old days”, football before Sky, Abramovich and Arab millions. His achievements are isolated in time, buried under football’s green, crinkly sediments. He was defeated by a force that becomes more despicable with each passing day. That, more than anything else, is why Brian Clough remains a popular subject. Fans and journalists are increasingly disillusioned with football, disgusted by its corruption and financial instability. Writing about Clough and the days when a team like Nottingham Forest could win the European Cup is a peaceful retaliation, a friendly poke in Cristiano Ronado’s eye, a vehicle of symbolic resistance to Blatter, Sky and football’s other immovable behemoths. Clough is simultaneously the essence and the antithesis of modern football. He was wild and spontaneous enough to have survived in our glitzy, football saturated world, to have starred amid the contrived drama of English Premier League football. But Clough and his defining achievements were what we sacrificed on the altar of television, the joys we forfeited for unceasing, self-indulgent sport. His story, if not his influence, is very much a thing of the past.